On the last track, we discussed steps I take to prevent a client’s suicide: establishing a family history, reviewing a checklist of risk factors, and giving advice to the client’s family. On this track, we will examine the role childhood and upbringing play in a bipolar adult client’s life: characteristics of functions and dysfunctional families; types of dysfunctional families; and family communication. The first characteristic I take into account is the effect of a dysfunctional family on an adult bipolar client’s life. Obviously, childhood is not necessarily the defining factor as to whether or not a client develops bipolar disorder. However, researchers at the National Institute of Mental Health have identified some family behavioral patterns that may contribute to mental illness which include: using denial to manage anger and anxiety; having unrealistic expectations and standards; finding it difficult to form intimate external relationships; and passing low self-esteem from parent to child. A functional family is one that supplies both social and appropriate sexual training; provides an environment conducive to every family member’s survival and growth; values each individual equally; reinforces each member’s self-esteem and sense of belonging; and reduces anxiety and promotes a spontaneous atmosphere of laughter and fun. Dysfunctional families might value every individual, but gives on special treatment; belittles or criticizes when members express their thoughts or emotions. There are several types of dysfunctional families and include the following: the perfect family; the overprotective family; the distant family; the chaotic family; and the abusive family. In a "Perfect Family," members may look happy and content on the surface, but are really submerging their feelings whether out of fear of criticism or any other reason. In this type of family, members focus on appearances. A bipolar client that comes from this type of family may be more prone to deny their illness due to how it would look to outside people. The "Overprotective Family" is one in which members smother other family members rather than support them naturally. Bipolar adults raised in this kind of environment may not prove resistant to diagnosis, but may resist talking about emotions in therapy because they’ve been taught to regret expressing their emotions. In a "Distant Family," members show little affection for other members which will result in a bipolar adult’s isolating him or herself. The "Chaotic Family" is one in which the parents are unavailable and rules are either inconsistent or nonexistent. Bipolar adults who are raised in a chaotic environment tend to have relationship problems because of their inability to abide by the rules and guidelines of a healthy relationship. Finally, the "Abusive Family" is the poster child for dysfunctional families. In this type of family, violence and anger are given free reign. Children may experience physical, sexual, or verbal abuse which is manifested by only one parent while the other one lives in denial. 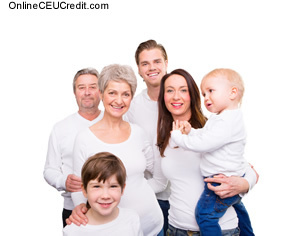 Adults who are brought up in this type of family tend to have numerous trust problems and may be generally cynical against any kind of therapy treatment. In addition to the characteristics of dysfunctional and functional families, I also analyze a client’s family’s communication styles. Often, miscommunication occurs in the Ladder of Inference presented by Dr. Chris Argyris. In Dr. Argyris’ theory, there are four levels or rungs. a. The first rung represents an observable action or statement. An example might be kissing a child good night or saying "I love you". b. The second rung represents a culturally understood meaning. In Western cultures, a kiss or saying "I love you" means someone cares for you. c. The third rung represents a meaning we attribute to the action or statement. If, for instance, a parent does not kiss a child or say, "I love you," the child may conclude that the parent does not care. d. The fourth rung represents the theories clients use to make third-rung conclusions. For this example, the child might theorize that parents who care always kiss their children and say "I love you." Although a parent might indeed love their child, that communication might be lost in the ladder of inference. Lorraine, age 46, used to conclude that her parents did not love her as a child because their communication was not as affectionate as Lorraine believed loving families should be. Because of this, Lorraine had unknowingly taken a fatalistic stance to her disorder, believing that she herself deserved the disorder. 1. List them on a tablet or compile them in a notebook. 2. Place them on cards small enough to carry in your wallet, purse, or pocket. 3. Post them on signs and sticky notes on the bathroom mirror, the refrigerator, a desk lamp, or some other surface you’ll see daily. 4. Call your answering machine and leave them as messages to yourself. 5. Use a computerized reminder program or a text-to-speech program. 6. Transfer them to audiotape. Using these techniques, Lorraine can inundate herself with positive affirmations that will help her regain her self-confidence. Think of your adult client who is the product of a dysfunctional family. Could he or she benefit from the affirmations exercise? On this track, we discussed the role childhood and upbringing play in a bipolar client’s life: characteristics of functions and dysfunctional families; types of dysfunctional families; and family communication. On the next track, we will examine the three types of treatments that clients may take in addition to therapy: psychotropic medications; non-medicinal treatments; and hospitalization. What are three aspects to keep in mind when analyzing the role childhood plays in an adult bipolar client’s life? To select and enter your answer go to CEU Answer Booklet.